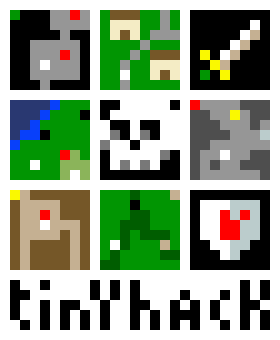 Tinyhack is about as minimalist an adventure game as you can get. Going back to play Legend of Zelda on the NES might seem simple after playing the 3D, vertex-shaded, bloom-lighted games of today, but Rob Beschizza of Boing Boing's Tinyhack will show you what a simple game really is. It's an adventure game that plays out on a grid of just 9x9 squares. Tinyhack boils gaming down to its simplest elements. It uses pixels of different colors to represent various virtual objects. The player is a square of white, dungeon entrances are red, gold artifacts are yellow, and monsters are brown and purple (those purple ones are tough!). The player's health is represented by a square of green that darkens as it lowers. The goal is to collect 16 gold artifacts to get the key to the island fortress. Players can find a sword, shield, and boat to help them along with way, in addition to magical abilities. The name of the actual game is randomly generated from set titles when you load it up. I got titles such as Nemesis's Gemstone, The Sphinx's Artifact, and Dreamstone of the Unicorn. They all basically work because, well, the graphics leave a lot to the imagination. Despite its minimalist style, Tinyhack is not easy. It requires some memorization to learn which dungeons to take on first for health management purposes. It's a fun little thing though, and reminds us that gaming is not about graphics all the time. You can play it here.